Sturdy, durable RhinoRamps allow for reliable and convenient access to the underside of your vehicle. Patented polymer internal support system and wide stance offer excellent weight distribution and unbeatable strength. The innovative CoreTRAC non-skid base helps reduce slippage while the 17-degree incline provides easy use for low clearance vehicles. These portable automotive ramps are great for cars, trucks, pickups, sport utilities, and vans. Made from thick, durable, rubber that is built to last. Features a high traction non-slip raised surface. Can be used with vehicles, mowers, handtrucks, wagons, carts or anything else with wheels. Extra wide ramp - 35 1/2 inches. Easy to transport. Durable extra wide ramp. Allows you to overcome any curb. Measurements: LxWxH 35.5" x 10" x 3.75"
Made from thick, durable, rubber that is built to last. Features a high traction non-slip raised surface. Can be used with vehicles, mowers, handtrucks, wagons, carts or anything else with wheels. Extra wide ramp - 35 1/2 inches. Easy to transport. Durable extra wide ramp. Allows you to overcome any curb. Made from thick, durable, heavy-duty plastic that is built to last. Features a high traction non-slip raised surface. Can be used with vehicles, mowers, handtrucks, wagons, carts or anything else with wheels. Monting holes on each side of ramps allow you to bolt the units together (bolts are included) to make one double wide ramp. Easy to transport. 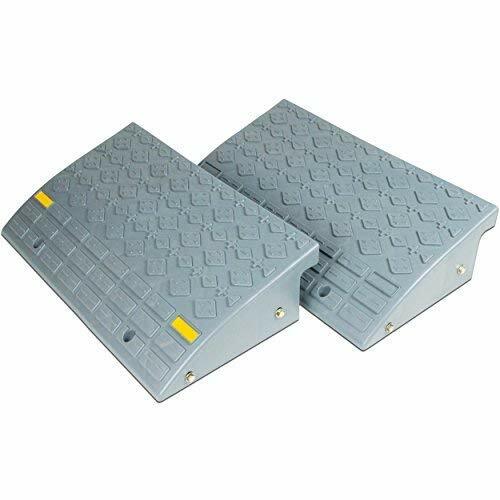 Durable set of two ramps. Allows you to overcome any curb. Made from thick, durable, heavy-duty plastic that is built to last. Features a high traction non-slip raised surface. Monting holes on each side of ramps allow you to bolt the units together (bolts are included) to make one double wide ramp. Easy to transport. 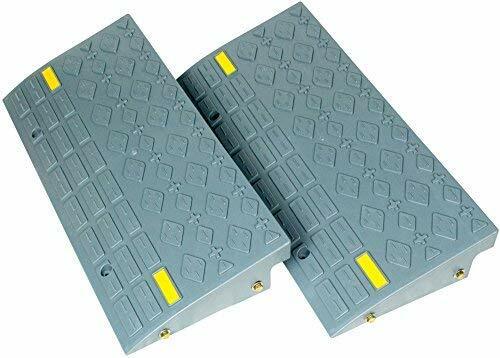 Durable set of two ramps. Allows you to overcome any curb. Measurements: LxWxH 23.5 x 13.5 x 6 Weight capacity: 4,000 lbs per ramp. Cable Protective Cover Ramp, Cord/Wire Concealment Protection Track, Hassle-Free Features: Rugged, Durable, Reliable Protective Cable Concealment Bright & Visible Yellow Safety Color Flip-Open Top Cover for Hassle-Free Cable Placement (2) Channel Groove Design for Running Cables Safe in High 'Walking-Traffic' Areas Anti-Slip Textured Surface Ability to Cover Multiple Cables/Wires/Cords Non-Interfering Style Allows Wheels & Carts to Roll Over Interlocking Design Allows for Multiple Connection Lengths Perfect for Power Lines, Extension Cords, Network Cables, etc. Used in Homes, Offices, Warehouses, Stores, Stages & More Extra Rugged 2,000 lb. Max Load Capacity Maximum Cable Diameter/ Thickness Compatibility: 1.2'' Heavy Duty Engineered Polyethylene Construction Size (L x W x H): 39.6'' x 9.8'' x 1.9'' The Pyle 'PCBLCO' Cable Ramp Track Covers provide safe and reliable cord and wire management. Made from heavy duty engineered construction, these cable protectors add safety and comfort in any environment -- indoors or out! The bright yellow color makes the system clearly visible and the anti-slip textured surface can handle the stresses of high-traffic public areas. The extra rugged construction has an impressive 2,000 lb. load capacity and the non-interfering design allows carts and strollers to roll right over. Interconnect multiple tracks for cable management in larger demanding areas. Keep your equipment safe and allow everyone to pass-by with the Pyle 'PCBLCO' Protective Cable & Wire Concealment Ramps (sold as single track). 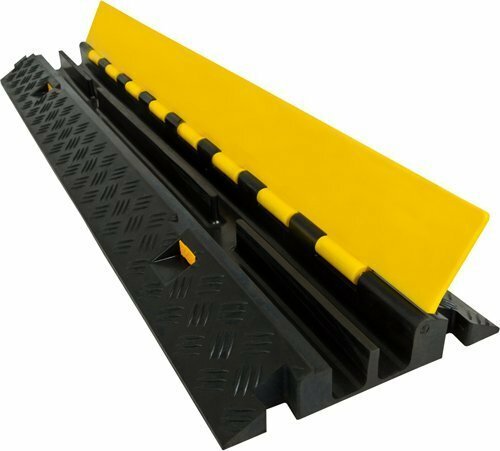 Industrial or commercial application, heavy duty dual channel rubber cable ramp straight piece with 18000 lbs. per axle maximum capacity. Runs along shop and warehouse floors to protect important power cables from vehicle traffic.Protects cables, wires, and hoses warehouse vehicle traffic indoors or outside. Heavy duty thermoplastic rubber with a highly visible yellow safety lid (Operating Temp. -40F to 131F). Channel dimensions: 0.6" x 0.4"
Runs along shop and warehouse floors to protect important power cables from vehicle traffic. Protects cables, wires, and hoses warehouse vehicle traffic indoors or outside. 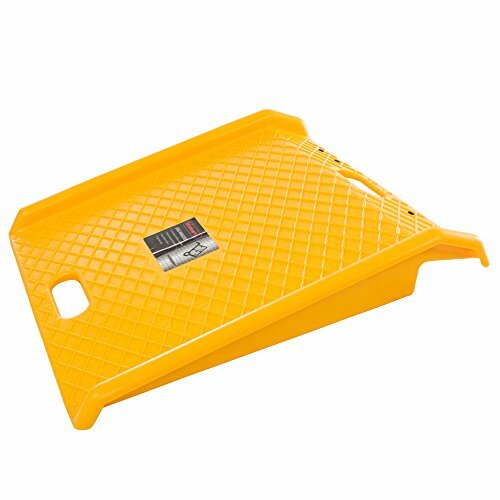 Heavy duty thermoplastic rubber with a highly visible yellow safety lid (Operating Temp. -25 to 149 ). Like all rubber made products, sometimes an out gassing odor may be present since these units are brand new. This odor will dissipate in time (few days to a few weeks). We recommend you air them outdoors before placing them indoors. The Stalwart high density polyethylene curb ramp helps to simplify the movement of hand trucks, wheeled carts, wheel chairs and more over curbs or steps as high as 8 inches! The sturdy ramp has a holding weight capacity of 1000 pounds, has built-in traction support on the surface and weighs less than 10 pounds so it is easily portable to take with you on the go. SATISFACTION GUARANTEED- Stalwart is committed to providing the consumer with the absolute best price and value on all of our products, which we ensure by applying a rigorous quality control process. 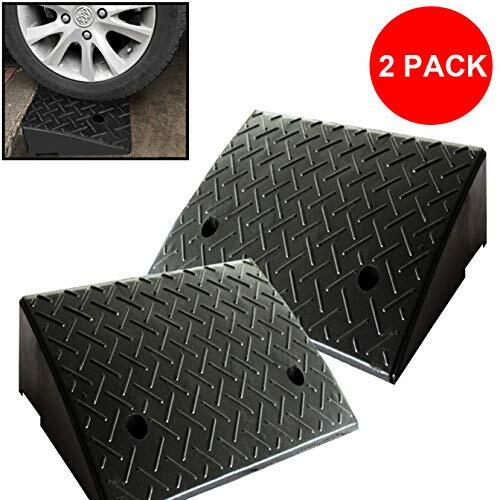 NOTE: This is an exclusive product of Stalwart and ONLY Curb Ramps by Stalwart are GUARANTEED to be genuine IMPORTANT: Avoid buying counterfeit products and transacting with unauthorized sellers. Look for our logo on the packaging for every one of our products.Stalwart is a registered trademark protected by U.S. Trademark law and will be vigorously defended. DURABLE - Stalwart products are constructed from durable, high quality materials. 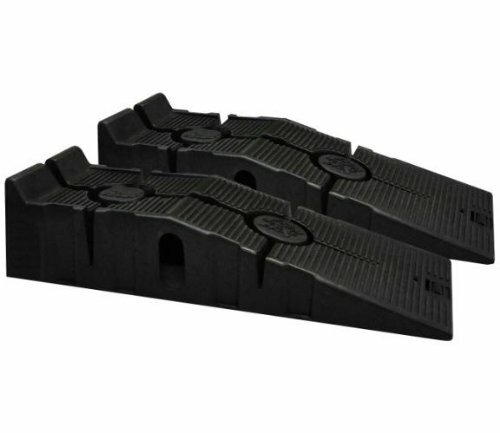 Made of High-Density Polyethylene or (HDPE), this ramp has a weight capacity of 1,000 pounds and is built to last. 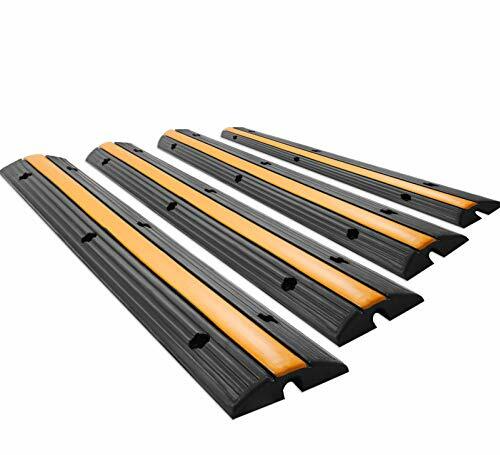 SAFE- With raised, rounded 1 side rails to help keep your wheels on the ramp, bright yellow coloring for visibility, and a textured surface for extra traction and stability to prevent sliding when wet, this curb ramp was designed with safety in mind. PORTABLE- This lightweight ramp also has two rounded handles and does not require any tools for installation making it easy to maneuver and portable to take with you wherever you need it most. MULTIPURPOSE USAGE - The Stalwart curb ramp can be utilized for a variety uses. 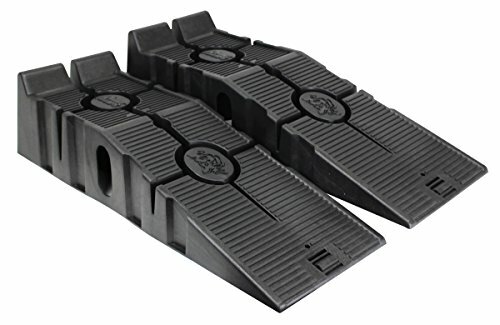 Ideal for getting wheelchairs, bicycles, walkers, mopeds, hand trucks, wheeled carts, and more over curbs or over a single step. PRODUCT DETAILS - Size: Length 27 inches, width 27 inches, height 4 inches. Made of HDPE with a weight limit capacity of 1,000 pounds. 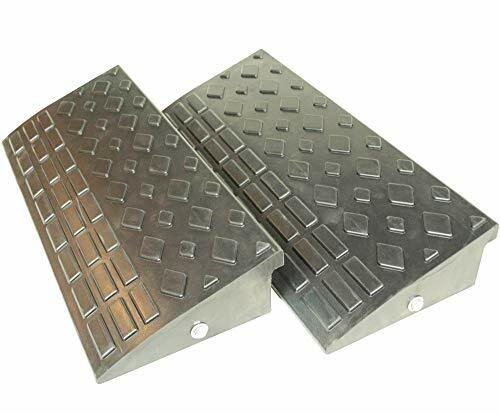 Set of Two Medium Size (4 inch Tall) Curb Ramps. Car, Truck, RV, Trailer, Cart or Handtruck. Can be Bolted Together or Used Separately. Designed to help roll over curbs approximately four inches tall. Can also be used for shed entrances. Made from thick, durable, heavy-duty polymer plastic that is built to last. Features a high traction non-slip raised surface. Intended for vehicles, mowers, handtrucks, wagons, carts or anything else with wheels. Ramps feature mounting holes on each side of ramps allow you to bolt the units together (bolts are included) to make one double wide ramp. Measurements: Width of each ramp:23.5, Length of each ramp:10.5, Height of each ramp:4. Weight capacity: 4,000 lbs per ramp. Cable Protective Cover Ramp, Cord/Wire Concealment Protection Track, Extra Wide Features: Rugged, Durable, Reliable Protective Cable Concealment Bright & Visible Yellow Safety Color Safe in High 'Walking-Traffic' Areas Anti-Slip Textured Surface Design Ability to Cover Multiple Cables/Wires/Cords Non-Interfering Style Allows Wheels & Carts to Roll Over Interlocking Design Allows for Multiple Connection Lengths Perfect for Power Lines, Extension Cords, Network Cables, etc. Used in Homes, Offices, Warehouses, Stores, Stages & More Extra Rugged 2,000 lb. Max Load Capacity Maximum Cable Diameter/ Thickness Compatibility: 1.2'' Heavy Duty Engineered Polyethylene Construction Size (L x W x H): 38.6'' x 11.0'' x 1.6'' The Pyle 'PCBLCO' Cable Ramp Track Covers provide safe and reliable cord and wire management. Made from heavy duty engineered construction, these cable protectors add safety and comfort in any environment -- indoors or out! The bright yellow color makes the system clearly visible and the anti-slip textured surface can handle the stresses of high-traffic public areas. The extra rugged construction has an impressive 2,000 lb. load capacity and the non-interfering design allows carts and strollers to roll right over. Interconnect multiple tracks for cable management in larger demanding areas. Keep your equipment safe and allow everyone to pass-by with the Pyle 'PCBLCO' Protective Cable & Wire Concealment Ramps (sold as single track). Sturdy, durable RhinoRamps allow for reliable and convenient access to the underside of your vehicle. Patented polymer internal support system and wide stance offer excellent weight distribution and unbeatable strength. The innovative CoreTRAC non-skid base helps reduce slippage while the 17 degree incline provides easy use for low clearance vehicles. These portable automotive ramps are great for cars, pick-ups, sport utilities and vans. 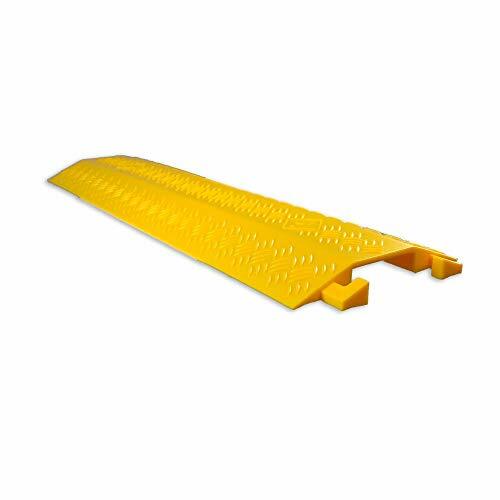 Cable Cover Ramp, Cord/Wire Protector Concealment Track Features: Rugged, Durable, Reliable Protective Cable Concealment Bright & Visible Yellow Safety Color Safe in High 'Walking-Traffic' Areas Anti-Slip Textured Surface Design Ability to Cover Multiple Cables/Wires/Cords Non-Interfering Style Allows Wheels & Carts to Roll Over Interlocking Design Allows for Multiple Connection Lengths Perfect for Power Lines, Extension Cords, Network Cables, etc. Used in Homes, Offices, Warehouses, Stores, Stages & More Extra Rugged 2,000 lb. Max Load Capacity Maximum Cable Diameter/ Thickness Compatibility: 0.5'' Heavy Duty Engineered Polyethylene Construction Size (L x W x H): 39.8'' x 4.9'' x 0.8'' The Pyle 'PCBLCO' Cable Ramp Track Covers provide safe and reliable cord and wire management. Made from heavy duty engineered construction, these cable protectors add safety and comfort in any environment -- indoors or out! The bright yellow color makes the system clearly visible and the anti-slip textured surface can handle the stresses of high-traffic public areas. The extra rugged construction has an impressive 2,000 lb. load capacity and the non-interfering design allows carts and strollers to roll right over. Interconnect multiple tracks for cable management in larger demanding areas. Keep your equipment safe and allow everyone to pass-by with the Pyle 'PCBLCO' Protective Cable & Wire Concealment Ramps (sold as single track). Made from thick, durable, rubber that is built to last. Features a high traction non-slip raised surface. Can be used with vehicles, mowers, handtrucks, wagons, carts or anything else with wheels. Can be placed side by side to make one wide ramp. Easy to transport. Durable set of two ramps. Allows you to overcome any curb. Measurements: LxWxH 24" x 10" x 3.75"
Can be placed side by side to make one wide ramp. 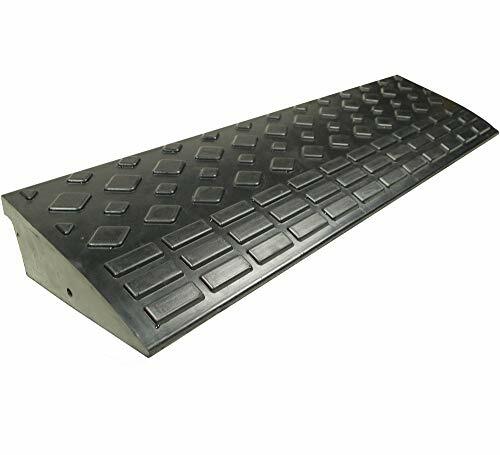 Provide easy access over curbs for trucks, forklifts, or other heavy-duty equipment with this rubber curb ramp. The 35 lb. Guardian ramp features a 60,000 lb. weight capacity, a reflective surface for increased visibility, and rubber treads for maximum traction in any weather conditions. Easily accommodate wires and small hoses with the two integrated channels underneath the ramp. 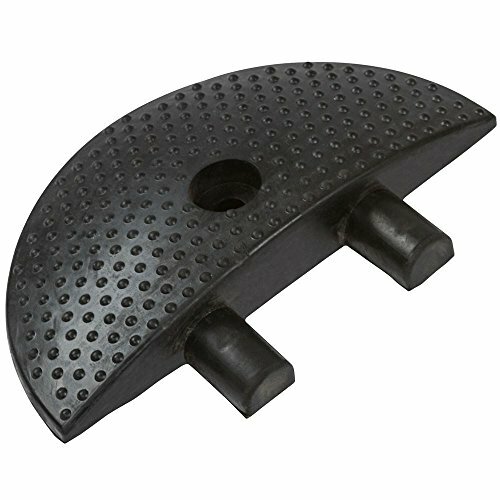 Two pre-drilled holes give you the option for permanent installation (hardware not included), and the modular design allows you to build your own custom ramp system for specific applications. Measures 1' 2 L x 23-1/2 W and weighs 35 lbs. Maintain a safe pedestrian environment by slowing down vehicle traffic with the Guardian 6' Modular Speed Bump. The simple modular design allows you to connect multiple sections to span the width of roads, parking lots, and more. This speed bump also features two 1-7/8 by 7/8 channels for cable protection or drainage. 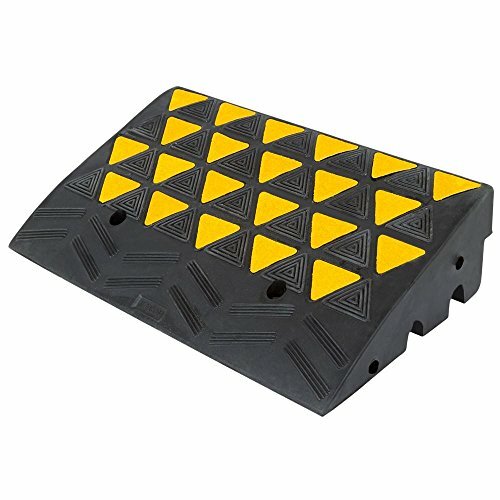 Four reflective beads embedded on each side of the speed bump along with five yellow EPDM rubber strips ensure visibility at night. 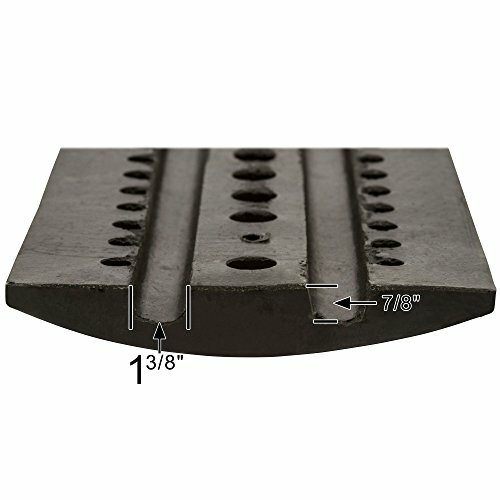 Permanently install the 6' long speed bump on asphalt or concrete using its pre-drilled countersink mounting holes (hardware not included). Modular end sections (sold individually) cap off the ends for a complete circular finish to create a smooth transition from the end of the speed bump to the ground. 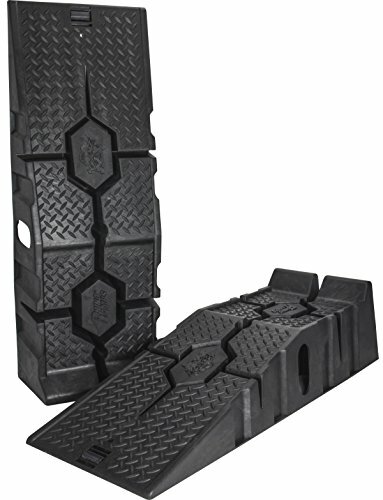 The modular speed bump is manufactured from weather-resistant durable rubber that will not break, chip, or crack. Includes a one year manufacturer's warranty. Due to this product being made from a rubber material, dimensions may vary +/- 2%. *Due to the nature of rubber, the Load Capacity will vary due to environment, temperatures and surfaces. Made from Industrial Grade Rubber - Items are brand new and will emit an odor that will dissipate over time like all rubber products. 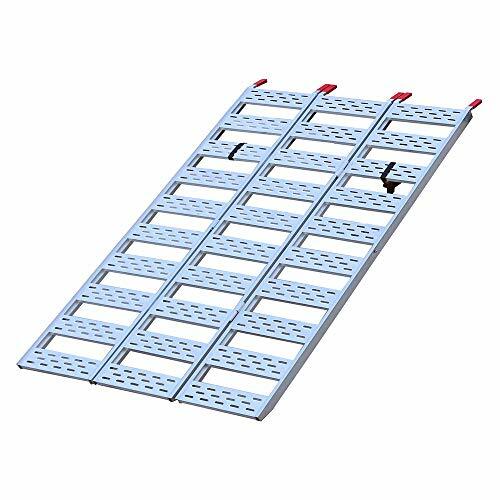 Safely loading and unloading your cargo and equipment is extremely important, and Cargo Smart Aluminum Tri-Fold Ramp offers the best and most efficient way to do so. You can trust this 50 W x 76 L ramp for safely and easily loading and unloading vehicles like push mowers, ATVs, garden tillers and more. The distributed load per ramp capacity is 1, 500 lb. per ramp, giving you peace of mind that your equipment is secure. Adjustable safety straps are included, ensuring your equipment stays safe during loading and unloading. LIGHTWEIGHT RAMP: The lightweight, aluminum ramp is easy to transport and carry, but strong enough to load and hold your heavy equipment. It also provides a single ramp surface for easy positioning. LARGE TREAD DESIGN: The large tread design with traction cut outs means your equipment will stay safely on the ramp while loading and unloading. SECURE LOADING: The included adjustable safety straps make for a secure loading and unloading experience, ensuring your equipment will safely be loaded onto your truck. RUSTPROOF: Built with strong and durable rustproof aluminum construction, this tri-fold ramp will last. 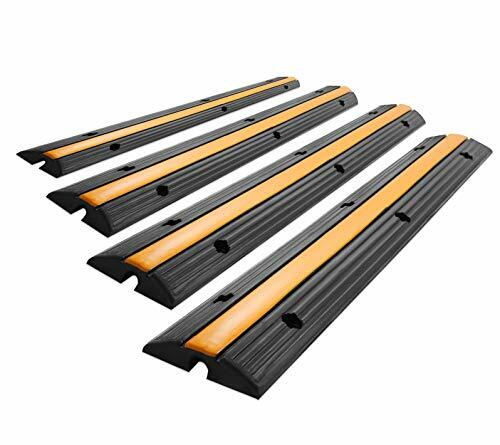 50 W x 76 L.
4 Pack Single Channel Rubber Cable Protector 18000 LBS Capacity Cable Ramps Speed Bump Easy to setup and use, the cable protector ramp eliminates worries of buldging hose lines,pinched electrical wires and crushed cabling in high traffic work areas. Great cable protection outdoors! Cable ramp dimensions: 39"x 6"x 1.2".Channel Dimensions: 0.6"x 0.4"
Each package comes with 4 expansion bolts for helping you install. Combine multiple curb ramps together to create your own custom ramp for specific applications. Great for vehicles,forklifts,buses,mowers,wagons,fire truck,commercial vehicle,excavators,SUV,RV,trailer and other heavier equipment,also great for bicycles,hand trucks or lawn and garden equipment. 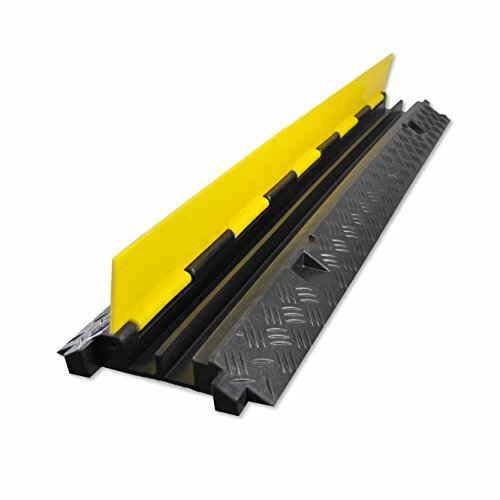 Attach speed bump ends to the modular speed bump middle sections to create a smooth transition from the speed bump to the ground, reducing vehicle damage. The modular speed bump system can be used indoors or outdoors and features a skid-resistant surface and may be used temporarily or mounted permanently.